The City Council vote on Wednesday followed overwhelming approval in a referendum by city voters on March 21 authorizing the city to allow Sunday says in convenience stores and restaurants. County voters, including those living in the county’s four cities, approved Sunday sales in an election on Nov. 8, but Watkinsville opted to hold its own special election on March 21 to get authorization to change the city’s ordinance. The Council held a called meeting at 8 p.m. on March 24, following official certification of the election results, to give first reading and initial approval to the ordinance changes. The called meeting at 7 p.m. on Wednesday was to give the second reading to the ordinance changes and then take a vote of Council. Council Member Connie Massey voted against the ordinance at the Wednesday meeting. According to City Clerk Julie Sanders, Massey also voted against the ordinance at the first reading on March 24, and Council Members Brian Brodrick, Marci Campbell, Dan Matthews and Christine Tucker voted in favor, as they did at the Wednesday meeting. 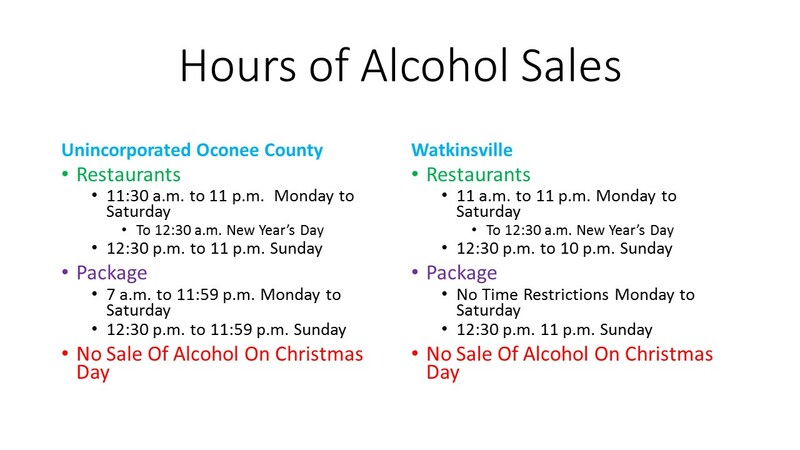 The passage of the Watkinsville ordinance leaves the county and city with just slightly different hours of operation for alcohol sales at restaurants and convenience stores and groceries. 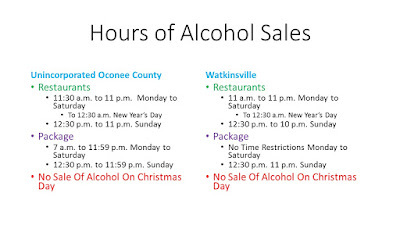 In the county, restaurants cannot begin alcohol sales until 11:30 a.m. on Monday through Saturday, but sales in Watkinsville restaurants can begin at 11 a.m. In both the county and the city, restaurant sales must end at 11 p.m. Monday through Saturday. Sunday sales in county and city restaurants cannot begin before 12:30 p.m. Sunday sales must end by 11 p.m. in county restaurants and by 10 p.m. in Watkinsville restaurants. Package sales Monday through Saturday begin at 7 a.m. in county grocery and package stores and run until just before midnight. In Watkinsville, no time limit is set for alcohol sales in convenience stores. Sunday package sales cannot begin until 12:30 p.m. either in the county or in Watkinsville, but they end at just before midnight in the county and at 11 p.m. in Watkinsville. None of the other three cities in the county has a restaurant, and Bogart alone allows alcohol sales at convenience stores, but not on Sundays. The complete video of the brief meeting of the Watkinsville City Council on Wednesday night is below. The video also has been added to the Watkinsville City Council Channel of the Oconee County Observations Vimeo site. Penny Mills recorded the video on Wednesday night. We were not able to make a recording of the meeting on March 24. OCO: Watkinsville Council 3 29 2017 Called from Lee Becker on Vimeo.